Antisemitism/Islamic Jihad – Do they have anything in common? And are they equally important? 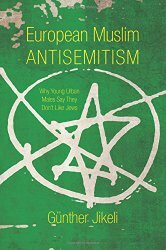 Prof. Gunther Jikeli of Germany has just published a book on his research of antisemitism among Muslims in Europe today. And what about these questions: Are Jews evil? Are Zionists trying to take over the world? Do Jews deserve to be attacked? Did they deserve to be attacked in Nazi Germany? What about Israelis? Are they any more criminal or evil than anyone else? Perhaps you are among those, whether you are Muslim or not, who do not agree with these statements. Are you represented above or below the yellow line in the graph? The line measures the percentage of antisemitic ideas among those people who do not self identify as part of either the far left or the far right in Europe. Their agreement with the above statements varies widely from 35 % of the population to 6% of the population polled depending on the individual question. In this way the graph examines the not always obvious beliefs about Jews in the general European population whether they are Muslims or not, whether they are members of the far left or the far right. The highest number, 35% of the European population believe that, “The Jews use today their status of victim-hood of the Nazi genocide during the second world war for their own interest?”. This is a sickening statistic attesting to the underlying antisemitic notions of the European public and attests to the lack of understanding of many in Europe that the systematic murder of six million Jews was not just another atrocity but a rupture of civilization. How did professors, philosophers such as Martin Heidegger, professionals, and the common man, acquiesce to the Nazi program of expulsion and murder of their Jewish compatriots, and so many other Jews just because they were born Jewish. 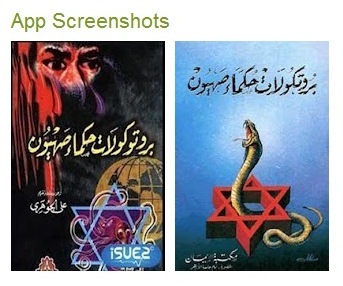 Moreover, anti-zionism, anti-Israel propaganda is also part of the ideology of Islamic Jihad. and more and more outrageous ideas about Israel and Jews are propagated every day by the Islamic world. Have you heard that Israel is the creator of Islamic Jihad? An article by Manfred Gerstenfeld exposes these outlandish ideas that are daily propagated by Islamic scholars. 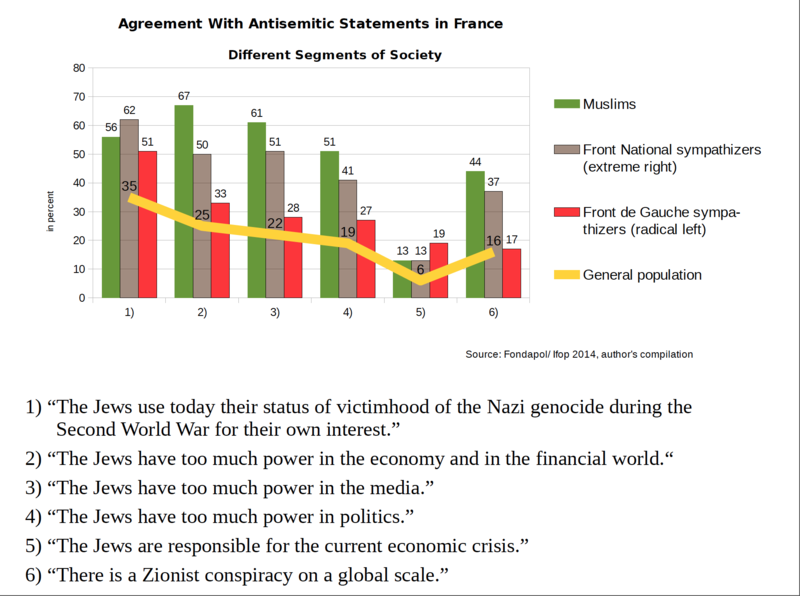 Although Muslims are most prominent in their assent to these antisemitic tropes or lies about Jews, Europeans – on the far right and the far left are not far behind. As you can see from this graph, some of them are Muslims, some are identified as belonging to the far right/Nazi parties and most are not identified. This exposes the lack of attention paid to these antisemitic violent crimes by the authorities and the public. Sadly, anti-zionist, anti-Israel Muslim forces, often those advocating on behalf of Palestinian refugees, have long been active in poisoning the minds of European/western students about Israel as well. On many universities in Europe and in North America, Israel is equated with the Nazi state and with Apartheid South Africa, and similar calumnies, such as the IDF harvesting organs for trafficking and murdering babies. 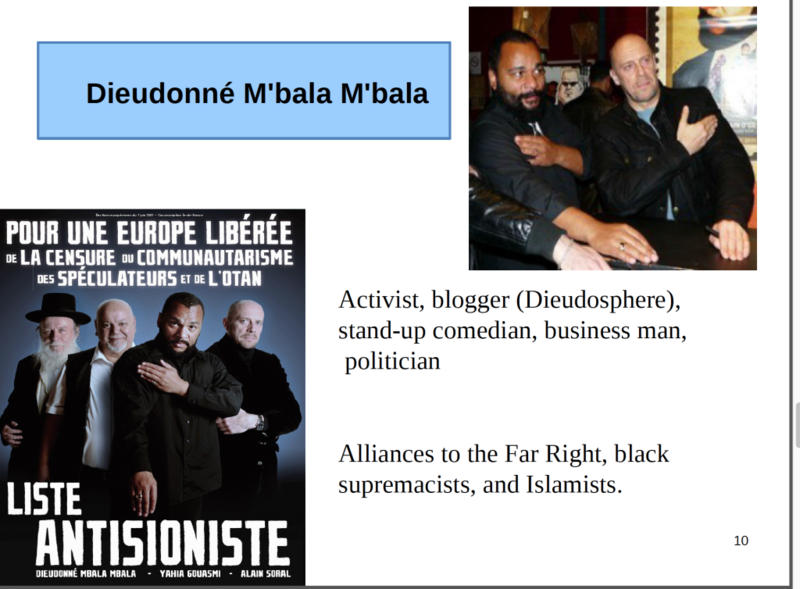 The acceptance of such antisemitic ideas among Europeans, whether Muslim or not, is highlighted by the popularity of Dieudonne M’bala M’bala. Below are two slides created by Prof. Jikeli to illustrate this point. 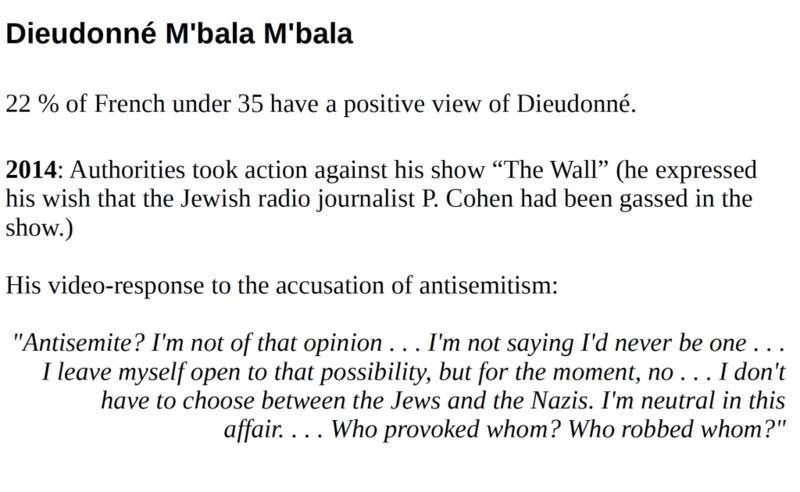 And just as any bully will only be strong if no one stands up to him, the silent acquiescence to antisemitic ideas by the general public has greatly emboldened the anti-semites and the jihadists and resulted in a massive increase in hostile antisemitic actions. 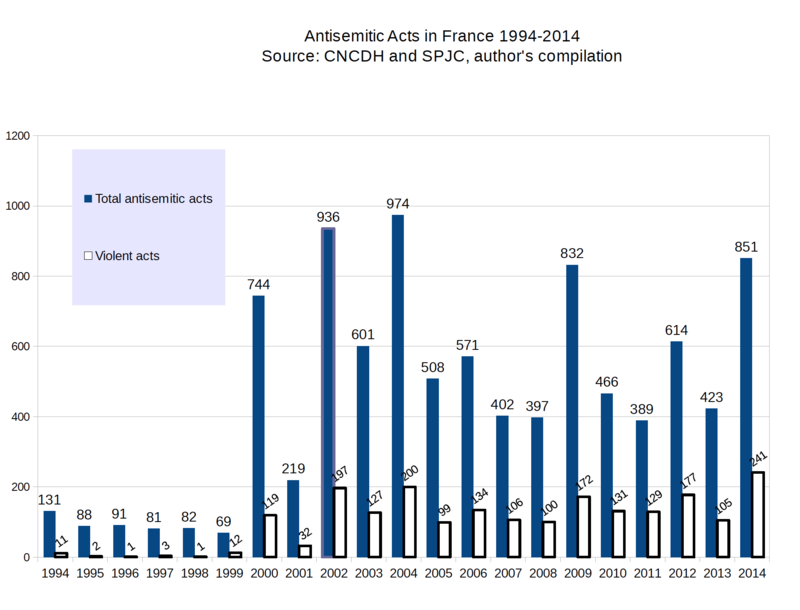 Antisemitism has greatly increased in France since the year 2000 as most people have stood idly by and refused to name the beast whether it comes from Muslims or non-Muslims. And this has resulted in a massive and increasing exodus of Jewish families from France where they feel unsafe. 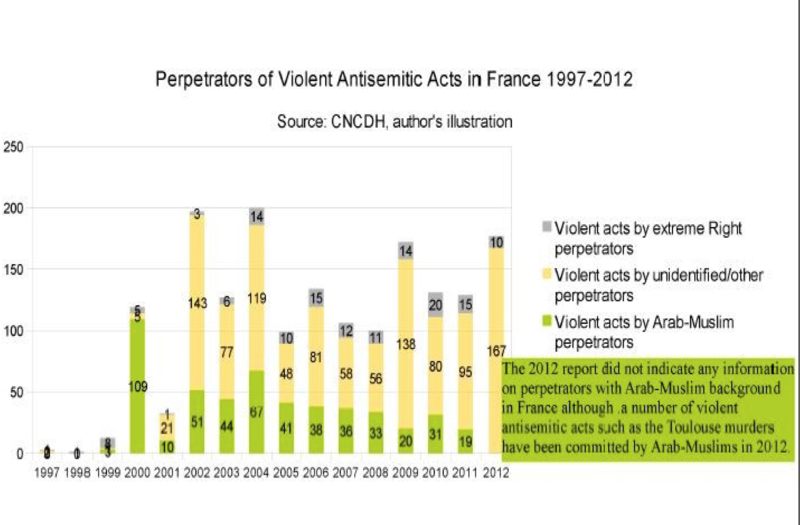 The increase in antisemitic acts and antisemitic violence is documented below. 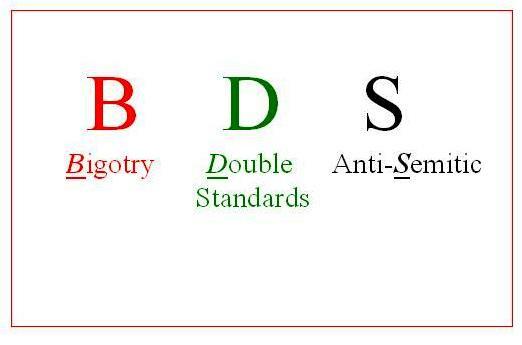 However antisemitism is only one strand of the anti-infidel Islamic jihad ideology. And these supremacist false Islamic ideas currently threaten the fabric of all European and non-European western democratic nations as can be seen by the recent indiscriminate attacks in France, Spain, Belgium, England, Australia, Canada and the United States. The picture below documents the recent attackers of innocent civilians in a cafe, in a concert hall etc.of which I am sure you are all well aware. The immorality, prejudice, and violent acts of the anti-semites and the jihadists have to be exposed, condemned, and prosecuted both by individuals, the media, and the state, if Europe is to make any headway in its current struggle with Islamic jihad and antisemitism. We all have to clearly understand what is antisemitism, what is Islamic jihad, and we must expose these and any other pernicious political currents that promote violence as a tool for change. If you want to see the insidious workings of these forces in the world for yourself watch this report on a notorious U.N. human rights official Alfred de Zayas — a hero to Holocaust deniers — for his new essay absurdly blaming the Paris terrorist attacks on America, the West and Israel. Are these ideologies important to understand? Yes indeed, for the sake of all humanity. If we don’t open our eyes, face these issues, and do our part, we are all doomed. 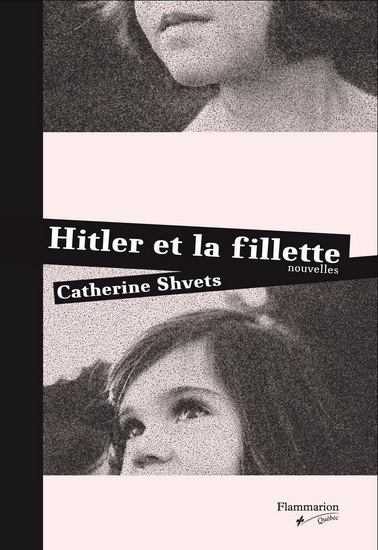 Sonia Sarah Lipsyc interviews Catherine Shvets about her book “Hitler et la fillette” that brings us into the moving experience of the holocaust through the eyes of a young girl. See it at : jQmtl Interview / Entretien avec Catherine Shvets sur « Hitler et la fillette », a 12 min video in French with English subtitles. At the tender age of fifteen, Catherine Shvets was writing about the Shoah through the memories of her survivor grandmother. She addressed the important actions of nameless rescuers who saved a little girl, the theme of Shvets’s recent oeuvre , « Hitler et la fillette », éd Flammarion/Québec, 2010. 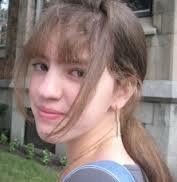 Catherine Shvets, born in Quebec of Russian Jewish heritage, is today twenty-one years old and a second-year student in philosophy of education at McGill University.